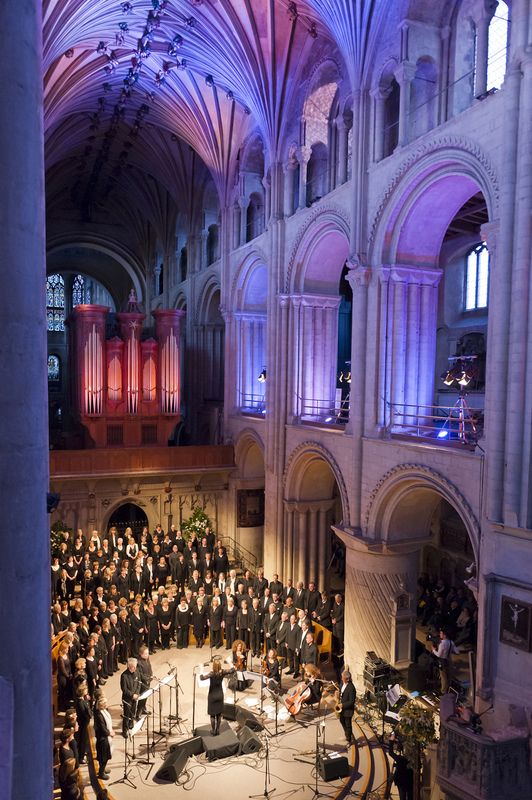 Norfolk’s internationally renowned Voice Project Choir is currently recruiting singers for their winter/Christmas concert at Norwich Cathedral on Saturday 14 December. The concert will feature new music from Jonathan Baker and internationally renowned saxophonist Andy Sheppard with words by Norwich poet Andrew McDonnell, celebrating the season with themes of music, metaphysics and the supernatural. Tim Tracey, who so skilfully lit Ideas of Flight at this year’s Norfolk & Norwich Festival, will illuminate the beautiful Presbytery of the Cathedral with imaginative lighting and visuals. Created by singers Sian Croose and Jonathan Baker in 2008, the choir has involved hundreds of singers in performances of great new vocal music as well as running workshops designed to build vocal confidence and explore a wide variety of uplifting and inspiring vocal music. The choir is one of the best known in the East of England and beyond. It has appeared at international jazz festivals in London, Gateshead and Normandy, been featured on BBC Radio 3, BBC 1 TV and peak time national TV in France. It has just been nominated for the second year running for a People’s Choice Award in the Norfolk Arts Awards and is regularly commissioned by Norfolk & Norwich Festival to create new work. The Voice Project Choir is a true community choir, welcoming participants of all abilities, ages, and backgrounds. No previous singing experience is needed, there are no auditions and everyone is welcome. Many members of the choir, who come from all over Norfolk, join time and time again, extolling the relaxing and therapeutic values of singing, others join on a one–off basis leaving with an enhanced sense of achievement and satisfaction. Established for over twenty years as a successful composer and performer, Andy Sheppard is one of a very few British musicians to have made a significant impact on the international jazz scene working with such luminaries as Gil Evans, Carla Bley, George Russell and Steve Swallow. He has composed over 300 works that incorporate a strong and characteristic sense of lyricism alongside a very personal use of rhythms from around the world. This entry was posted in Uncategorized and tagged andy mcdonnell, community choir, dave guttridge, music in norwich, voice project. Bookmark the permalink.